at the end of last season, I’ve been worried about the whole thing getting hijacked by zombies. I know, I know, I should know to trust George R.R. Martin for more than that. But in an age when pop culture itself is under siege by a horde of zombie dramas, comedies, and survival guides, I’ve been feeling perhaps a bit overprotective of the mostly medieval-ish, politics-laden fantasy world of Westeros. As the third season in Martin’s multi-book epic A Song of Ice and Fire wraps up, flames blaze from Daenerys Targaryen’s ambition and from her dragons–who, like the White Walkers were also believed to be extinct. For a long while, I’ve been waiting for a “history repeats itself” maneuver where the old gods, the Starks who still pray to them, and the White Walkers who dominated in the old god era would square off with the new gods, the currently-ruling southerly nobles, and the next-gen Targaryen dragons. But (duh) I am realizing that we may have hope for something a bit more novel to be afoot. I’ve not been paying enough attention to what the god of light might signal. A god who’s new to Westeros entirely and whose followers worship through fire, the lord of light and his coming–through that exquisitely creepy Melisandre who’s been hanging out with Stannis and now also through the Men Without Banners–may signal a whole new era of Westeros’ history. A third era of gods, maybe? 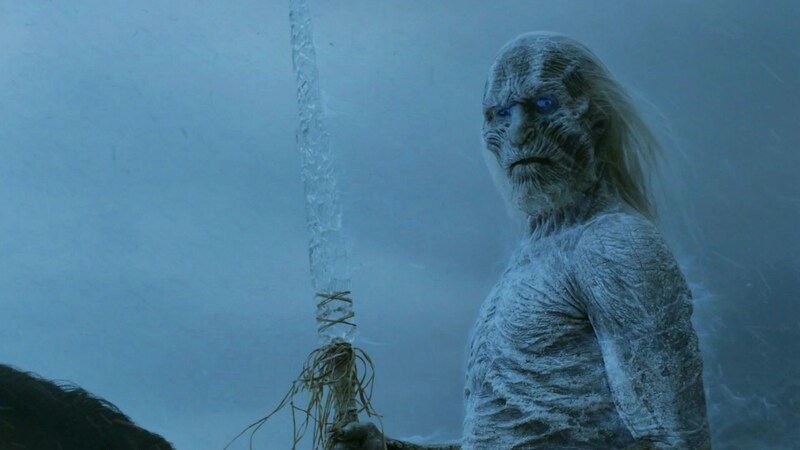 At the very least, this new god–whom I’d once dismissed as likely a one-season entity–is an emerging source of fire in the ice-and-fire conflict to whom I’ll be giving more consideration. Nonetheless, left with Martin’s structuring opposition–a choice similarly and more famously posed by Robert Frost—I’m still rooting for the world to end in ice. I, too, am feeling intensely protective of the GOT world and anxious that the other shoe will drop and jump the shark in a Fonz jacked… And the only thing that scared me more than the prospect of Zombies taking over was the incredibly poorly thought out and terribly executed black smoke baby. I reveled in the revelation this episode (or in the previous) that the Lost-ish monster was a one time deal. Love reading your take on this and all things TV.